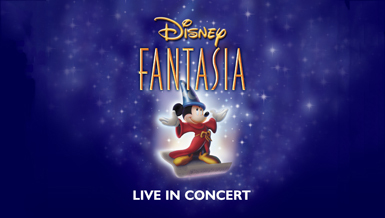 On Sunday 21 October the Royal Albert Hall in London will be hosting Disney Fantasia Live in Concert. Disney shares one of its crown jewels of feature animation in this UK premiere which showcases selections from Walt Disney’s original Fantasia and Disney’s Fantasia 2000. Fans will be able to enjoy Disney’s groundbreaking marriage of symphonic music and animation. These high definition screenings, accompanied by the live performance of some of the most memorable classical music ever composed, will be brought to life by the London Philharmonic Orchestra, conducted by John Mauceri. A selection of the magnificent repertoire from the original 1940 version of Fantasia and Fantasia 2000 including Tchaikovsky’s The Nutcracker Suite and Gershwin’s Rhapsody in Blue will be performed live while iconic moments from Disney’s stunning footage, including Mickey Mouse as he dabbles in magic in Dukas’ The Sorcerer’s Apprentice and the mythical unicorns and winged horses that accompany Beethoven’s ‘Pastoral’ Symphony, are shown on the big screen. With over 70 years since its original release, Disney’s stunning visuals and Stokowski’s timeless soundtrack continue to be treasured by audiences of all ages. Suitable for all the family, this is an unforgettable experience for all generations. Tickets are available from the Royal Albert Hall. Disneyland Paris today lauched a preview video to give a sneek peek to how the park will celebrate its 20th Anniversary. Highlights include Disney Dreams which is an amazing new night-time show, the new parade Disney Magic on Parade!, and the Disney’s 20th Anniversary Celebration Train.